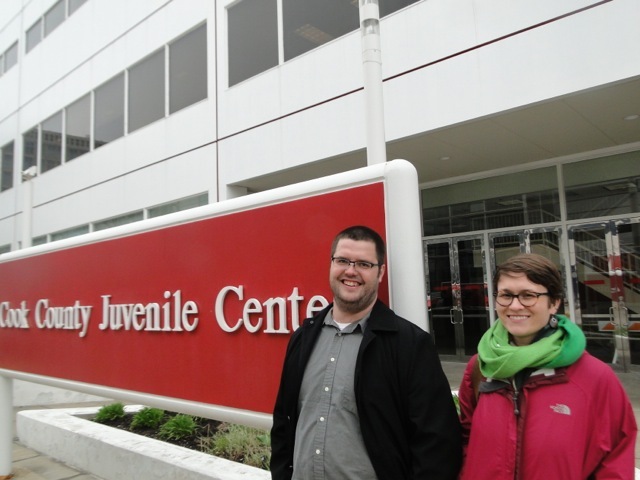 Peter Hamann and Sharlyn Grace staff the Juvenile Expungement Help Desk, housed in the Cook County Juvenile Center on Chicago’s Near West Side. Tens of thousands of juveniles are arrested in Cook County each year. But many of them don’t understand that they now have an arrest record that can linger like a digital ghost for decades to come. Without question, there’s a lot of misinformation about what happens to juvenile arrest records and juvenile court records. That’s true even among young people who might otherwise be cynical about interaction with the police or the juvenile justice system. “Even those young people will very frequently think that their juvenile record goes away automatically when they turn 18—or they think that no one can see them, “ Sharlyn Grace said. But that is wrong big-time, she says. Chart: When can a juvenile record be expunged? Grace and fellow attorney Peter Hamann staff a free walk-in center that’s like Cook County’s “Ground Zero” for helping people figure out if and how they can clear their juvenile records. Their small, unobtrusive office is called the Juvenile Expungement Help Desk, and it’s tucked into the Cook County Juvenile Center on Chicago’s Near West Side. Some kids say this white behemoth of a building looks like a friendly office building. That’s until they find out it houses Cook County’s jail for kids who’re waiting for trial. The juvenile courts are in the building too, as are offices for the Public Defender, State’s Attorney, Probation Department and Clerk of the Circuit Court. “A great number of individuals who come into our Help Desk every day come in, in shock, when they’ve just been denied from a job, or denied, you know, school applications. Guidance counselors letting them know that this arrest that may have happened quite a long time ago when they were a very young kid is coming back and it is presenting a barrier for them now,” Hamann said. Hamann and Grace are part of a partnership between their respective organizations, Cabrini Green Legal Aid and LAF, formerly known as Legal Assistance Foundation. The groups have several joint initiatives and one of them is to help people navigate an expungement process that can be lengthy and confusing. “You can get arrested and go to court and a jury can find you ‘not guilty’ and the court record and arrest record of that incident in which you were actually found ‘not guilty’ is still going to be on your record until you exercise your rights to expungement and you clear the record through the court process,” Grace said. Under the Juvenile Court Act, both arrest and court records for juveniles in Illinois are confidential and sealed. That sounds pretty off-limits. So why should people have to spend time and money to expunge juvenile records, if they’re already protected? Especially for jobs that require certification or licensing. And that covers a broad spectrum of professions including lawyers, doctors, nurses, school teachers, barbers, beauticians, security officers and more. These are jobs in which the application form will typically include a request for authorization to run a background check. Once a prospective employer sees that, “even while you may figure that these records are sealed and you don’t have to worry about them,” Hamann said, “there’s a whole number of exceptions where it’s within their right and it’s commonplace for them to consider juvenile arrest records." He says that includes the Chicago Park District and many government jobs. In 2013 there were about 26,000 juvenile arrests in Cook County. A little over 20,000 of those were arrests that never led to formal criminal charges. Now, bear in mind that juvenile records can’t be expunged until a person turns 18. So each year you have people in the pipeline, coming of age, who are eligible for those expungements. But as you see in the chart above, in 2013, there were only 660 juvenile records expunged in all of Cook County. These are the kinds of numbers that have caught the attention of Chicago Mayor Rahm Emanuel and others. And now there’s a movement afoot to make certain kinds of expungements much easier. Illinois State Sen. Kwame Raoul and State Rep. Arthur Turner are sponsors of legislation called The Clean Slate Initiative. In instances like these, Raoul says, young people get what’s called a station adjustment. That means the police send them home with a parent or guardian, maybe they have to do some community service work, or take a class. The case is not referred to prosecutors. If Raoul’s legislation had been in place in 2013, the 20,000 or so juvenile arrests in the chart above– the ones that didn’t result in criminal charges– those would‘ve been eligible for automatic expungement when the individuals turned 18. That would have happened if they avoided any more arrests in the 6-month period following the original arrest and had no new arrests that landed them in court. Vermilion County Sheriff Pat Hartshorn is not a fan of this proposed legislation. Sheriff Hartshorn is chairman of the legislative committee for the Illinois Sheriff’s Association. He says what proponents of this legislation aren’t taking into account is that many, many cases—including serious cases—are handled as a station adjustment. That means that intentionally, the case is not referred to court for formal court proceedings. They can’t have it both ways, he says. If supporters of Raoul’s legislation want police to handle cases by diverting them from court, Hartshorn says, then they also have to acknowledge that these are legitimate, serious cases. Raoul, a former juvenile prosecutor with the Cook County State’s Attorney’s office, bristles at the critique. The whole point of the bill, Raoul says, is to automatically clear records for less serious, non-violent juvenile cases. The Mayor’s office reports that 98 percent of all the station adjustments done by Chicago police in 2013 were for misdemeanor offenses and that none included weapons or shooting offenses. Meanwhile, the “clean slate” bill has passed out of the Illinois Senate and is expected to go to the House floor for a vote sometime in the next few weeks. The Illinois Sheriffs’ Association is the only organization on record against the legislation, and even Sheriff Hartshorn says it may pass.